Made to be worn for sport, leisure and downtime, our men's Devon sweat shorts are ideal for pairing with our micro modal t-shirts for a stylish and comfortable combination. Part of our leisurewear range, we have designed garments that embody our philosophy of 'Smart Comfort'; combining sumptuous fabrics with modern styling and considered details, thereby creating garments that are practicable for the gym or sports. Made with high quality, carbon-brushed loopback cotton for a truly luxurious handle, small innovative touches such as a curved back yoke, silent rear pocket zip and zip puller that is contoured to your fingertips elevate our Devon sweats into the sport-luxe category. By pre-washing the garment and carbon-brushing it, we give a truer, more comfortable fit that won't shrink in the wash or deteriorate as you wear it. 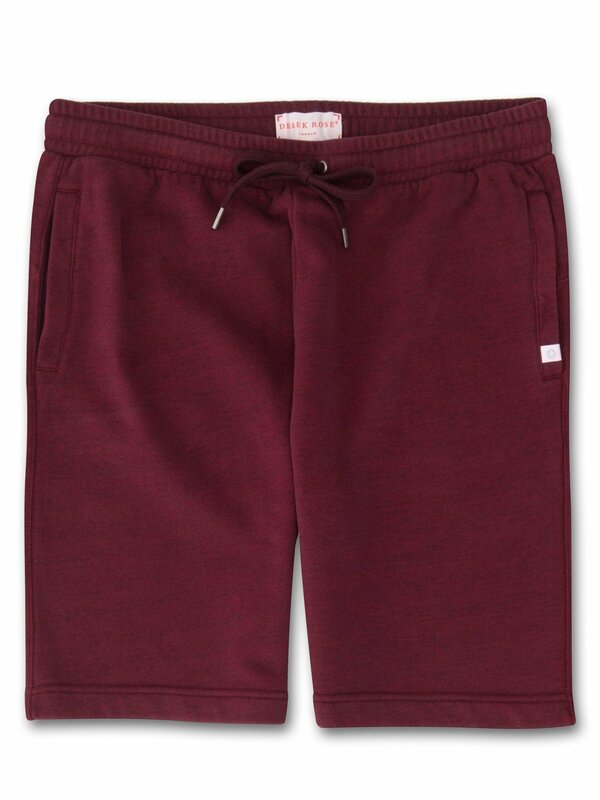 The Devon sweat short in burgundy red is finished with two front side pockets, a rear pocket and a combined elasticated and tied waist for comfort. The model is 6'1" / 186cm tall with waist size 32". He wears a size Medium.